Steve Gunderson, the former congressman (R-WI) who heads APSCU, the lobbying group for America's for-profit colleges, seems to be getting desperate. The industry he represents is seeking once again to block the Obama Administration from issuing a "gainful employment" rule that would, eventually, cut off federal student aid to career training schools that consistently leave their students with overwhelming debt. But in contrast to the last time this fight occurred, in 2010-11, in this round the dispute is taking place against the backdrop of mounting law enforcement investigations and whistleblower lawsuits against the industry, greater public awareness of the abuses of these schools and declining enrollments and revenues. APSCU members like EDMC, Corinthian, ITT Tech, Career Education Corp., Kaplan, Bridgepoint and Globe have been exposed for abuses and are on the ropes; others, like ATI and FastTrain, have been forced to shut down for egregious behavior. A New York Times front page story this week, about another troubled company, Premier Education Group, once again highlighted how predatory for-profit colleges use a toxic mix of deceptive recruiting tactics, high prices, poor quality programs and weak placement efforts to fleece taxpayers and ruin students' lives. So Gunderson has ratcheted up, in the mode in which he and his industry excel -- indignant bombast. Gunderson has thundered in the past that APSCU member schools "should be congratulated" for enrolling low-income students, even though many of their students are left far worse off from the experience. His rhetoric seems to imply that for-profit colleges are entitled to the continued flow of tens of billions each year in taxpayer dollars, regardless of the quality of their programs. When President Obama went to Fort Stewart, Georgia, in 2012 and signed an executive order to provide U.S. military service members and veterans with better information about their educational options, Gunderson called it a "deeply unfortunate development." As this round of the "gainful employment" dispute intensified a few weeks ago, Gunderson lashed out with this remark about the Administration's intent: ''What they're really saying is that if you are poor, you can't go to school." No doubt egged on by the wealthy industry barons on his board of directors, Gunderson also renewed his claim that the Obamans are ideology motivated, with an APSCU statement that negotiators chosen by the Department of Education for the gainful employment rulemaking were "opposed to the very existence of our institutions." And now, here comes the wow part that my upworthyish headline promised: An education website called The EvoLLLutionn interviewed Gunderson and asked him his views of the latest Department of Education draft gainful employment rule. Gunderson again attacked the rule, and then offered this analysis of how it would harm Americans: "If you are a student who goes into a career that is personally rewarding but probably not financially rewarding and you are low income, and you work either in rural America or in the intercity, you are now being told you can't do that anymore, even though that's what you wanted to do." What Gunderson appears to be saying is that a serious gainful employment rule would deny Americans the right to attend a program that is extremely expensive -- so expensive that it would be difficult to pay back your student loans even if you actually managed to obtain the job you were seeking when you enrolled. In other words, the rule might eventually shut down programs that left students $120,000 in debt and, at best, positioned them for a $30,000 job as an assistant chef, medical assistant or apprentice electrician, with not enough earnings to pay down their loans. Well, darn right -- yes: The whole point of the rule is to protect students and taxpayers by giving career colleges incentives to lower their prices, raise their quality and improve their job placement efforts. The big for-profit colleges get about 86 percent of their revenue from federal aid. It's a government program, not a free-market program. And it is absolutely appropriate to condition that federal aid on the schools delivering quality programs at fair prices. 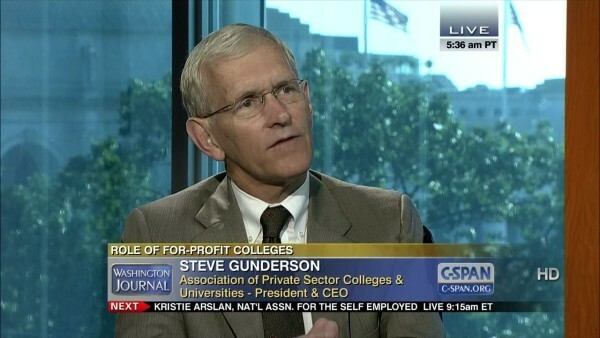 Gunderson defends this position because powerful APSCU member companies like EDMC (the Art Institutes) and Full Sail University charge astronomical prices; indeed, the actual cost to a student on financial aid of attending one of those for-profit colleges can be almost twice as much as attending Harvard or Stanford. Gunderson's efforts to harbor for-profit college companies that deceive and rip off students was extended on Friday with yet another lawsuit brought by APSCU to block Obama Administration regulations on the industry. This set of rules aims to protect prospective students from coercive boiler room sales tactics by barring career colleges from paying admissions staffers incentive compensation based on the number of students they sign up. The rules were first issued under President Clinton, but then gutted under President Bush and Assistant Secretary of Education Sally Stroup. President Obama toughened these incentive compensation rules again, but APSCU convinced a federal appeals court panel in Washington to block them, on the ground that the Administration had failed to offer an adequate explanation for why they were needed. The Administration responded to that court decision with a statement seeking to justify the rules, but the latest APSCU complaint claims this latest explanation also isn't good enough. It threatens to tie up the Administration, and the important rules, in court well past the end of President Obama's term. By the way, that Bush official behind gutting the rules, Sally Stroup, is now a top executive at APSCU. In seeking to strike down the incentive compensation rules, APSCU has hired the best lawyers that our tax dollars can buy -- powerhouse Gibson Dunn, the same firm that managed to convince a judge to block the first gainful employment rule, also for failure to provide an adequate rationale, and the same firm that represents EDMC, the second largest for-profit college company, against a Justice Department lawsuit alleging violations of, yes, the incentive compensation rules. Historians will note that APSCU's lead lawyer in the latest suit, Gibson Dunn's Douglas R. Cox, was part of the legal team that won the case of Bush v. Gore and made George W. Bush president.